Phil Jenkinson from PJPS Construction and Seb Glazer from The Vulcan Centre. 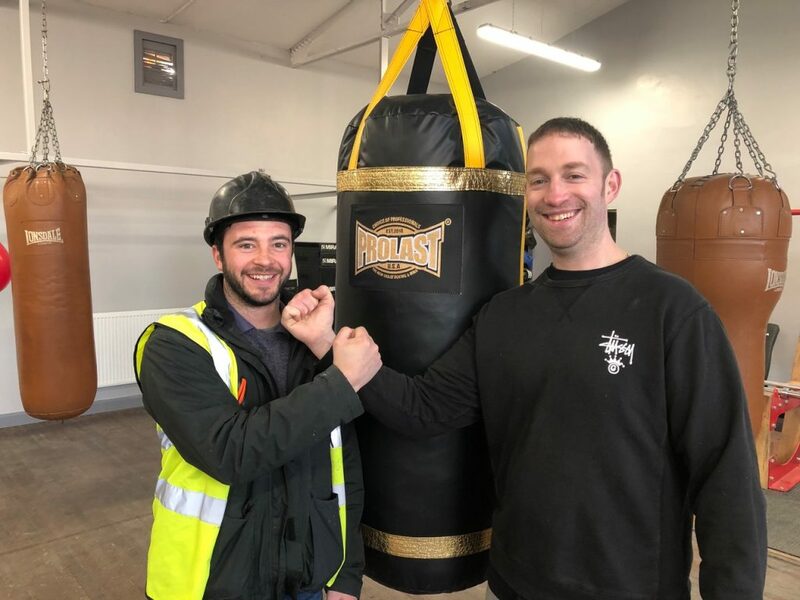 Local building contractor PJPS Construction has started work at Vulcan Boxing Club on The Boulevard, after it received much needed grant funding from Sport England (over £140,000) to extend and improve its fitness facility, building on its youth leadership strategy. The firm is carrying out works at the Vulcan Centre, adding a new cardio suite at the premises, originally owned by Hull Fish Trades as a boxing club. Now a registered charity, run by Dr. Seb Glazer a former probation officer and social worker, whose vision is coming to fruition to provide local people of all ages with a safe and secure environment to learn and get fit. Seb and his team work with schools and colleges to support those students struggling with mainstream education, mental health issues, problems at home and substance misuse, as well as older people to help combat loneliness. Phil Jenkinson, Director of PJPS Construction says: “We have been blown away by the good work at The Vulcan Centre and feel happy that we can contribute to its ongoing success. “With approximately 300 people using the centre each week, the building was cramped. What started out as a shed in 2012 has become a fully functioning learning and fitness centre for young and old people in the community to undertake classroom learning, employment skills support and physical fitness training. PJPS Construction has been in operation for seven years offering bespoke construction services to varied projects including new builds for property developers, their own new build developments, social housing, grand design projects and charity schemes such as this one. The company was proud to have completed the refurbishment of the Rank House on Holderness Road in Hull as part of a social housing project in 2015. PJPS Construction worked closely with Seb for almost eighteen months on the funding package. Phil Jenkinson put together a scheme to fit with the funding available from Sport England. Dr. Seb Glazer, Managing Director of The Vulcan Centre says: “We are delighted to be getting this work underway. We are fortunate to have received financial support to carry out the works. Seb used to train at the former Hull Fish Trades Boxing Club as a young boy and throughout his student years at The University of Hull. After working for the Probation Service and Social Services for a number of years, he became disillusioned with his career and wanted to do something that would really make a difference to young people’s lives. Along with his sister who worked as a teacher and a friend who is a youth worker, together they took over the Vulcan Centre and then rose to the challenge to make it into something amazing. For further information please visits www.pjpsconstruction.com and www.vulcancentre.co.uk. Be the first to comment on "East Yorkshire Construction firm enhances Boulevard Boxing Club"